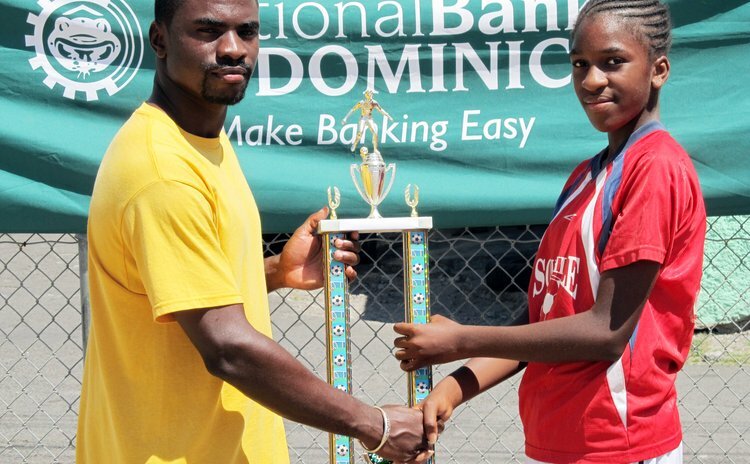 Grand Fond Primary School needed no help from Delices in winning the second National Bank of Dominica Primary Schools (PS) Girls Football Festival organised by the Sports Division. And along the way, the undisputed champions of primary schools girls' football, Grand Fond, would deny Goodwill PS an early opportunity to win both boys and girls PS football in the same year. Grand Fond beat Woodford Hill 2-0 in the final after a goalless first half in the 40-minute match. The stalemate was broken about the 24th minute of play when a Woodford Hill player missed on a clearance at the end of a corner kick to find the back of her own net instead. Oh, that shattered the Woodford Hill team. Their main defender had difficulty coping with Grand Fond's main two marauding attackers. She was blown for a blatant foul on one Grand Fond attack against Ethlyn Lockhart. Captain Lockhart, last year's most valuable player, made no mistake with the free kick to send her team two goals up with just over five minutes play remaining. That goal was the 10th for Ethlyn for the 2013 campaign. Grand Fond's principal was on hand along with parents and other teachers to savour that victory. Grand Fond and Delices combined in 2012 to win the first PS girls football festival when just four teams entered the competition. This second year with 15 schools participating, Grand Fond went all the way to the championship which culminated at the Newtown Savannah on Monday March 25 with the semi-finals, third place match and finals. On the way to the last four the 15 schools competed in three zones with the best eight teams advancing to the quarter-finals. Goodwill and Grand Fond PS came through quarter-final matches at Newtown. Goodwill took care of Castle Bruce 1-0 while Grand Fond knocked out St Joseph 3-1 in extra time. In the other quarter finals at Marigot, St Luke's eliminated Wills Strathmore Stevens 2-1 on penalties after the teams played to a 2-all draw including extra time and Woodford Hill beat San Sanveur 3-2. In the semi-finals, the Ashma Benjamin found the back of the net against St Luke's to give Woodford Hill a 1-0 victory. Grand Fond and Goodwill played to a goalless draw with Grand Fond going on to win the penalty shoot-out 3-2. St Luke's took the third place match 1-0 on penalties after their match with Goodwill ended without a goal scored. Three weeks ago, Goodwill PS boys won the boys competition at Portsmouth.